You are here: Home / Soccer / Club Soccer / It’s Now Time Louis Van Gaal Start Selecting De Gea? MANCHESTER, Sporting Alert – It is now time for Manchester United boss Louis van Gaal to stop playing hardball and pick goalkeeper David de Gea in his starting lineup. Van Gaal has refused to play the Spaniard, who was left out of the club’s two opening English Premier League games, because he believes the player is not focused enough, following unsettling reports about interests from Real Madrid. It was reported that De Gea told the club that he didn’t want to play the season opener against Tottenham, but the player has denied ever making such comments. In fact, Van Gaal himself has even said the goalkeeper has been training very well and has been a total professional about his job as he continues to wait on his future to be sorted out. So if this is indeed true, then it’s probably time for the Dutchman to cut out his naive ways and select De Gea, who was voted as the club’s best player in the last two seasons. Manchester United are holding out for a world record fee from Real Madrid for the former Atletico Madrid man, but the Spanish giants are refusing to commit to those demands and would rather wait until his contract expires at the end of the season when they can sign him for free. Their attempts all summer to land Sergio Ramos as part of the deal for De Gea has already squashed, as the Spanish centre-back, who honestly had no intentions of going to Old Trafford, opted to finally sign a new contract extension with the Whites this week. This now means Real Madrid would have to meet the asking price of Manchester United or De Gea will stay with the English Premier League outfits until the end of the summer. The La Liga club has categorically stated that they will not pay the fee the Red Devils want, with manager Rafa Benitez stating that he was happy with Keylor Navas and Kiko Casilla as his options. 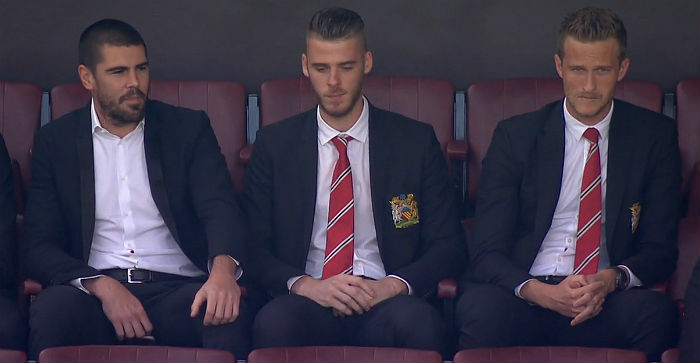 According to Sky Sports sources, Van Gaal and the club are prepared to keep De Gea and suffer the heavy financial hurt, which is why it makes no sense for him to continuously be left out of the starting squad. There are suggestions that the Spanish international could very well be included in the lineup for Manchester United’s Champions League first-leg play-off against Club Brugge at Old Trafford on Tuesday, and the supporters would welcome that move.